​The Sai Baba Nag Champa Incense is a masala based fragrance creates a deep meditative atmosphere and has a musky sweetness with a flowery top note. To Use: Light end, blow out flame and place in incense holder. I live in a remote location with limited shopping, so am happy to be able to order Nag Champa from Well.ca, knowing it will arrive quickly, and in good condition. I don't like the price, but I also don't need to buy huge quantities to make the shipping worth it. The Nag Champa at Well.ca is always fresh and never counterfeit, which I have had happen elsewhere. Worth it for the peace of mind for having a good product. 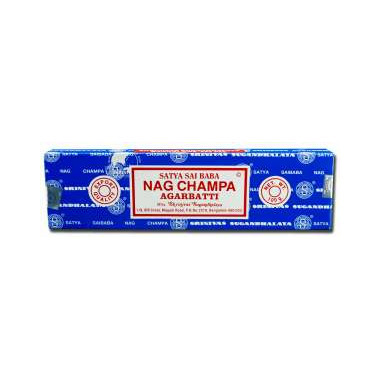 I am so extremely happy that this website sells the official Nag Champa. Where I live it's very difficult to find it, especially in the largest package. The price is well worth it, and I can't be more happy. Also, it's extremely FRESH.